Here is a very interesting set of exchanges edited by Kenneth Grasso and Cecilia Rodriguez Castillo, Theology and Public Philosophy: Four Conversations (Lexington Books 2012). The contributors include Charles Taylor, Nicholas Wolterstorff, Jeanne Heffernan Schindler, Robin Lovin, Jean Porter, and many others. The publisher’s description follows. 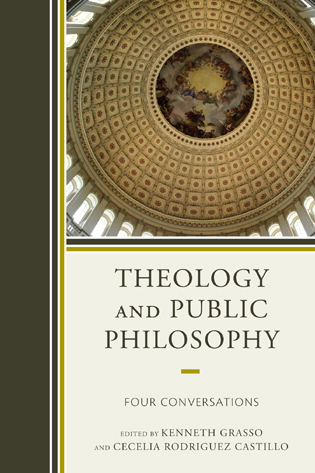 This volume brings together eminent theologians, philosophers and political theorists to discuss the relevance of theology and theologically grounded moral reflection to contemporary America’s public life and argument. Avoiding the focus on hot-button issues, shrill polemics, and sloganeering that so often dominate discussions of religion and public life, the contributors address such subjects as how religious understandings have shaped the moral landscape of contemporary culture, the possible contributions of theologically-informed argument to contemporary public life, religious and moral discourse in a pluralistic society, and the proper relationship between religion and culture. Indeed, in the conviction that serious conversation about the type of questions being explored in this volume is in short supply today, this volume is organized in a manner designed to foster authentic dialogue. Each of the book’s four sections consists of an original essay by an eminent scholar focusing on a specific aspect of the problem that is the volume’s focus followed by three responses that directly engage its argument or explore the broader problematic it addresses. The volume thus takes the form of a dialogue in which the analyses of four eminent scholars are each engaged by three interlocutors.